Embossed soft texture, organic lines, raised cylindrical forms and broad polished areas make these earrings very popular. They have just the right amount of detail to not over power the earrings themselves. These earrings are 1/2” x 1 1/4” with sterling silver ear wires. 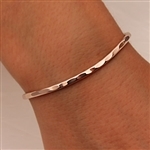 This is a great thin hammered cuff bracelet, as elegant as it is simple. This is made of 14k rose gold filled, a beautiful coppery color and very popular. This bracelet is very similar to our original thin bracelet, but has a new hammered texture. It is the same size and still has the graceful curve, but this bracelet has a much smaller, and more sporadic hammer blow. This bracelet compliments the other curved bracelets very well. You can't go wrong adding this to a set of bracelets, yet it looks fantastic on it's own. This bracelet is niobium (gunmetal) and is 3mm wide. This thin hammered cuff bracelet in yellow gold filled and the same style in sterling started it all. It lies so gracefully on the wrist. It’s elegant, simple and looks great dressed up or down. You can’t go wrong. Be sure to consider wearing multiples. This is a new thinner style of our mixed metal cuff bracelet. It has richly hammered niobium sides contrasted by a smooth polished tube of 14K yellow gold filled in the middle. This new style is the same width as our other thin (351) style bracelets, which is slightly thinner than the original bracelets with tubing. 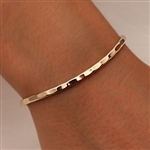 This bracelet is 14K yellow gold filled and is 3mm wide. This bracelet is very similar to our original thin bracelet, but has a new hammered texture. It is the same size and still has the graceful curve, but this bracelet has a much smaller, and more sporadic hammer blow. This bracelet compliments the other curved bracelets very well. You can't go wrong adding this to a set of bracelets, yet it looks fantastic on it's own. This bracelet is sterling silver and is 3mm wide. This sterling silver pendant has a beautiful hammered texture outlining the contrasting smooth surface in the middle. The unique shape of this pendant along with the light reflecting qualities of the hammered surface create a stunning piece. This pendant is 3/4" x 1" and comes on a 1mm sterling silver snake chain. 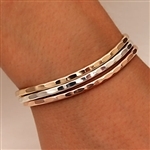 This is a beautiful, simple set of four thin 14K yellow gold filled bracelets. These bracelets all have the graceful curve and like most of my bracelets they have a deep rich hammer blow. They can be worn with the curves all flowing together, or intermingled as shown in the picture. This develops a pattern as well as a play of light that dances across the surface as you move the bracelet around. Each gold filled bracelet is a basic component to any group, and at the same time stands beautifully on it’s own. These heart-shaped 14K rose gold filled earrings have a beautiful hammered texture that reflects the light so well. They are a very simple design, yet wonderfully striking at the same time. These earrings are 3/4 x 3/4" and come on rose gold filled wires. This is a straight-line hammered bracelet with a richly patterned hammer blow. It has the distinct coppery color of rose gold. In this group of stacked thin cuff bracelets you can see how the graceful curve is repeated. You get the play of light dancing across multiple hammered bracelets as well as the different color of the metals plus the nice feel and look of stacked cuff bracelets. The organic lines throughout these ginkgo inspired earrings create a stunning and graceful look. Pierced 14k bi-metal and sterling are hanging in front of a sheet of richly colored niobium. The front and back sheet are puffed slightly outward, creating a pillow-like form. The three layers are suspended together, while allowing for some movement. There are 8 different interchangeable colors of niobium to choose from for the back sheets. There is also a 14K bimetal back option; this is listed as a separate item. These earrings are 1/2" by 3/4" and come on sterling silver ear wires. This 14k gold filled pendant has a beautiful hammered texture outlining the contrasting smooth surface in the middle. The unique shape of this pendant along with the light reflecting qualities of the hammered surface create a stunning piece. This pendant is 3/4" x 1" and comes on a 1mm gold filled snake chain. This cuff bracelet has a hammered surface on the niobium creating an elegant contrast to the polished tube of sterling silver over top. It has my classic curve that swoops down toward the hand and then tucks in comfortably at the palm of the hand. This looks great with the thick straight line bracelets, and especially well with the thin bracelets that have the same curve. All the bracelets are adjustable. This bracelet is very similar to our original thin bracelet, but has a new hammered texture. It is the same size and still has the graceful curve, but this bracelet has a much smaller, and more sporadic hammer blow. This bracelet compliments the other curved bracelets very well. You can't go wrong adding this to a set of bracelets, yet it looks fantastic on it's own. 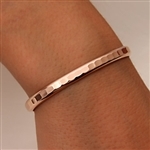 This bracelet is 14K rose gold filled and is 3mm wide. This gunmetal bracelet, made from Niobium, is a new twist to an old favorite. The thin hammered cuff bracelets that I've been making for 38 years are still a favorite today. They have the gentle graceful curve, and like most of my bracelets have a deep rich hammer blow. This develops a pattern as well as a play of light that dances across the surface as you move the bracelet around. This is a basic component to any group, and at the same time stands beautifully on it’s own. This bracelet is solid Niobium, and is 3mm wide. These 14k gold filled earrings have a beautiful hammered texture outlining the contrasting smooth surface in the middle. The unique shape of these earrings along with the light reflecting qualities of the hammered surface create a stunning set of earrings. These are 3/4" x 1" and come on gold filled ear wires. I really like this set because it shows so many of the possibilities. You can see colors next to other colors. You see curves with curves, straights with straights and curves with straights. The mixed metal bracelets add color and texture to any group and I think look really sharp. This is an outstanding set to have, with unlimited variations on how to wear them. When purchasing this complete set I am including the 352 thick Gold Filled for free, which is a discount of $84. The cost to buy the bracelets separately would be $530. ***Please note*** The two mixed metal bracelets in this set are now slightly thinner than the bracelets shown in the photo. We are transitioning to thinner mixed metal bracelets, the same thickness as the 351 style "thin" bracelets, in order to allow for more color options. The price has been reduced by $16 to reflect the bracelet substitutions. This heart-shaped rose gold filled pendant has a beautiful hammered texture that reflects the light so well. It's a very simple design, yet wonderfully striking at the same time. This pendant is 3/4" x 3/4" and comes on a 1mm rose gold filled link chain. This is a beautiful set of sterling silver bracelets. These bracelets all have a deep rich hammer blow that catches the light nicely. The thin cuffs have a graceful curve and the thick ones are a straight style. They can be worn with the curves all flowing together, or intermingled as shown in the picture. This set can be added to any other set, worn as shown, or worn individually. The options are endless with these beautiful cuff bracelets. This pendant is a wonderful piece. The top sheet is pierced sterling leaving graceful lines that are suspended over a niobium back piece. These two pieces are puffed in opposite directions, creating a clam-shell like form. This pendant is a 5/8" square and comes on a 1mm sterling silver snake chain. This pendant is also available in a 1" square. It is listed as a separate item, 416L.sn. Please note that the colors may vary slightly. 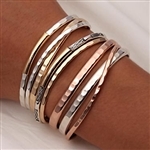 This is a beautiful set of rose gold bracelets. These bracelets all have a deep rich hammer blow that catches the light nicely. The thin cuffs have a graceful curve and the thick ones are a straight style. They can be worn with the curves all flowing together, or intermingled as shown in the picture. This set can be added to any other set, worn as shown, or worn individually. The options are endless with these beautiful cuff bracelets. This bracelet is similar to our original thin bracelet in size, but has couple new twists. It has a much smaller, and more sporadic hammer blow. Also, different than the curve of my other thin bracelets, this is a straight line bracelet.This bracelet compliments the other straight bracelets very well, yet it adds a neat affect to a group of curved bracelets. You can't go wrong adding this to a set of bracelets, yet it looks fantastic on it's own. This bracelet is sterling silver and is 3mm wide. These earrings, made of sterling and niobium, have a beautiful plant-form inspired design. This makes for a very simple, yet striking design that can be worn with just about everything. There are 8 different interchangeable colors of beautiful niobium to choose from for the back sheets. These earrings also have a 14K bi-metal option for the back. This is listed as a separate item. The movement of the two sympathetic shapes, the contrast in color of the two metals, and the difference in textures make these earrings truly stunning. These earrings are 5/8"x 5/8" and come on sterling silver ear wires. The third photo is of the backside of the pendant which shows how the ear wire looks. They are very easy to interchange the backs. Please note the colors may vary slightly from the pictures shown. the original bracelets with tubing.